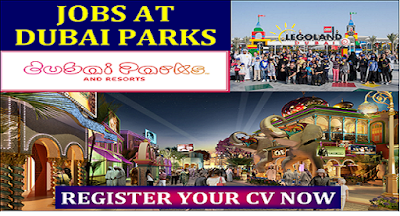 Jobs At Dubai Parks and Resorts. Dubai Parks and Resorts is a Middle Eastern integrated resort destination that incorporates a water park, 3 theme parks, a Polynesian themed resort and a Riverland, a gateway district with theater and restaurant experiences. Offering great entertainment, dining and accommodation for all the family, it is one of the region's most prestigious employers. If you are looking for jobs at Dubai Parks and Resorts, you will be pleased to learn that there are many opportunities across a range of sectors, so whatever your previous qualifications or experience, there is sure to be a job for you. Both temporary and permanent contracts are available and jobs can be both full and part time. There are vacancies available across the entire resort, meaning that there are always many roles that require filling, especially during busy seasonal periods. If you are a performer looking for a job at Dubai Parks and Resorts, there are regular auditions held throughout the year. There are roles available for singers, stunt performers, Bollywood performers, dancers, circus acts, trampoline acts, musicians and character look a likes. Performance contracts last for 13 months. Although in-person auditions are preferred, it is also possible to apply for a performance role via email, by providing a performance CV and links to a demo reel on YouTube or Vimeo. All information can be found on the company's website in the Careers section. If you are looking for jobs at Dubai Parks and Resorts, your first port of call should be the company's own website. The careers section offers all of the information that you need and enables you to search for suitable vacancies by keywood, location, sector or by contract type ensuring that you can find the ideal job. There are also vacancies with this company listed on general UAE jobsites such as WeJobz.com and CareerTracing.com. Applications can be made online.